The Thrill Of The Wild: Too Many Gearsets? Given the new gear coming out from Tomb of Sargeras, I've attempting to go through my bags and try to make some space, and it occurred to me how ridiculous my gearsets are starting to get. Perhaps other people have already realized all of these problems, or even had them in other expansions, but I think, for me at least, it's mostly based on how to equip legendaries, and playing multiple specs with fairly different stat priorities. Perhaps people who play support classes with heal or tank off-specs have known this trouble in the past, but for me, it's kind of new. I've never really had more than 5 or 6 at the absolute most: maybe one for each spec (which was unlikely in other expansions), one spec with a PvP gearset, and my main spec would maaaaaybe have an AoE and Single Target gearset, though I don't really remember a time where I had enough gear to really prioritize two separate sets with different stats for AoE and ST, mostly likely it was just different trinkets. And likely I would just swap around trinkets and stuff manually, not really make a gear set using the UI to do swap stuff around. With all of the different options for Legendaries and playing multiple specs, it's hard to remember which items I want to swap out when I need a different legendary. So here, just for the sake of being silly, I thought I'd post some of my gear sets. Legendary Wrists and Belt (the Harpoon buff legendary). Legendary Boots and Zevrim's (I don't really have any good AoE legendaries yet). Legendary Boots and Wrists (the bursting shot legendary). 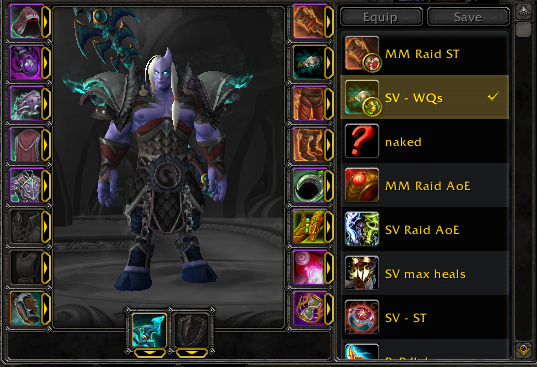 Everything the highest ilvl I have available for the slot. I don't remember what legendaries, but just whatever I have upgraded to 970 (though now I've got a lot more upgraded, but it's not important so I just leave whatever I first had on there). This is my oldest continuous gear set. I made it back in Cataclysm for taming that cat spirit beast in Mount Hyjal, since I didn't really camp it, but just flew by fairly often and needed to be able to drop my gear off real quick. Now I find it super helpful for reverse engineering abilities on the training dummies, so I've kept it. I haven't actually used this in quite a while. I think I made it right when the Broken Shores zone came out, and there were some weird issues with ilvl scaling for the rares, so I wanted more healing or something. Should probably delete it now. Legendary Helm and Prydaz (still haven't gotten the pants). I'm curious to hear from other people, especially if you're playing multiple specs. Do you find yourself making more gear sets for each different legendary combo you use? Or do you manually swap them out?